Electricity is available for $30. 6' tables available for $10 each (limit of 2). Booth fee includes 1 box lunch for vendor (additional lunches can be purchased for $7 each). Chairs are available if needed free of charge. Band students and parents are available to assist transporting vendor items to and from the vendor space and can watch the booth for short break periods if needed. Applications are available here and are due by November 10th, 2016. 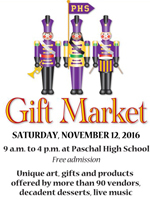 For more information, visit their website or contact their event coordinator at giftmarket@paschalpanthers.org / Jan 817-714-7778.